Green Gardener Photo Contest - It's Time to Vote! Here at the Metro DC Lawn and Garden blog, we are always trying to spread the word about the many benefits of Green, eco-friendly gardening. 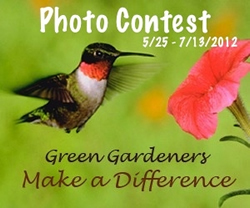 We’ve had some great photos entered into our Green Gardeners Make a Difference photo contest and now we would like your help in picking our winners. If the eco-friendly principle doesn’t seem obvious in the photo, please be assured that the entrants did list the principles when they submitted their photos. We know all of the great benefits that these properties provide and we are thrilled that these gardeners have decided to share their “green” efforts with our readers. We hope that you will help us encourage more Green Gardeners by adding your comments to the photos, sharing them with your friends and voting on your favorites. Click on a photo Title to read more information, to add a comment, or to share it. There is a button to share the photos on Facebook, but you can also add the link to Twitter or to your Pinterest Board to help get more votes. Remember, you only get ONE vote per day, through July 13th, so be sure to ask all of your family and friends to add their votes! I love them all, but I’m not allowed to vote!! Rain barrels are a great benefit to any eco-friendly landscape. They not only help conserve water, but they also allow us to re-direct rain water, helping to cut down on stormwater runoff, which can cause flooding and water pollution. To learn more about the benefits of rain barrels, plan on attending the Rain Barrel Workshop, being hosted by University of Maryland Extension Prince George’s County. Connect with other concerned citizens for a workshop to learn how to recycle rainwater for use on your property while also combating stormwater pollution entering the Chesapeake Bay. Contact Christie Balch at cbalch@umd.edu or at (301) 779-2806 x706 for more information.